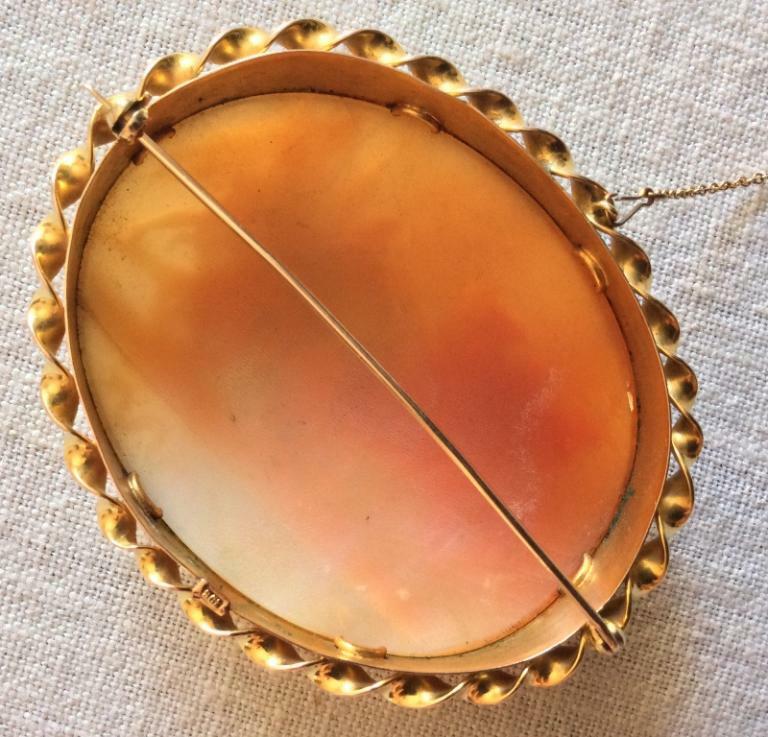 Material: Sardonyx Shell, 9k gold marked. 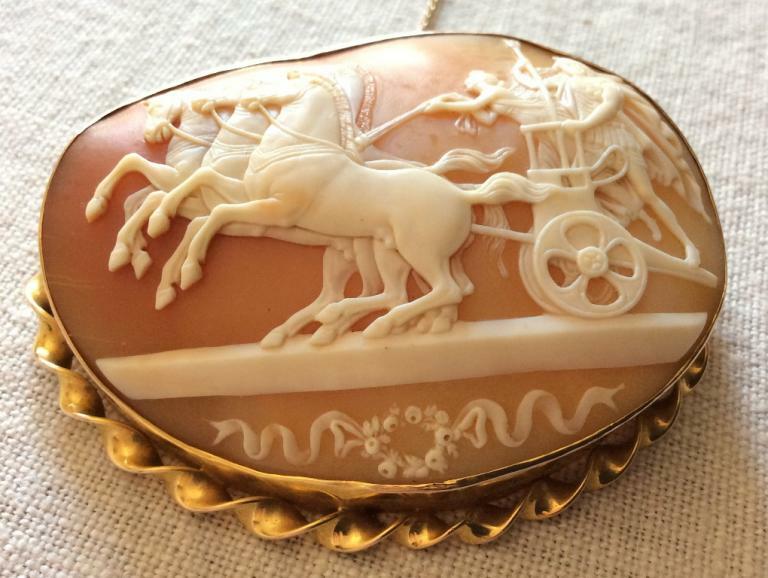 Size: 2 7/8" by 2 3/8" cameo itself is 2 5/8" by 2 1/8". 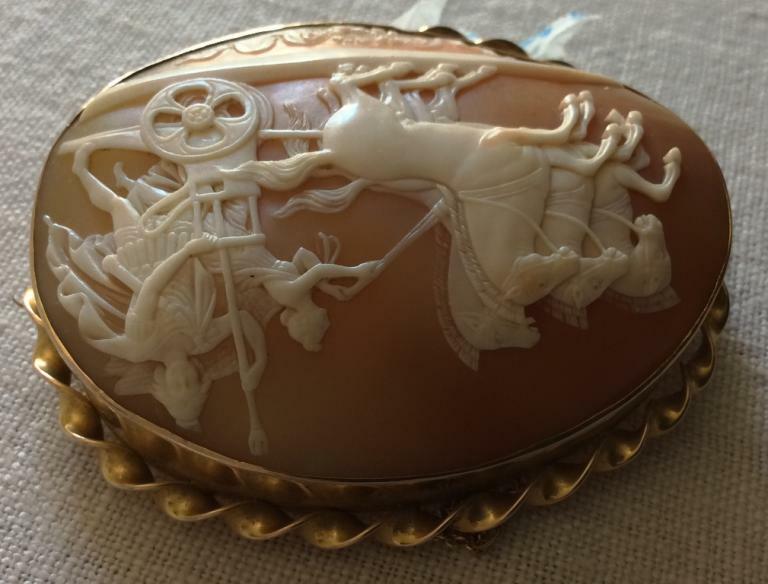 Date and Origin: Circa 1870 Italy. Conditions: Excellent, a few very slight natural shell lines, barely visible when cameo is backlit, not visible by naked eye. 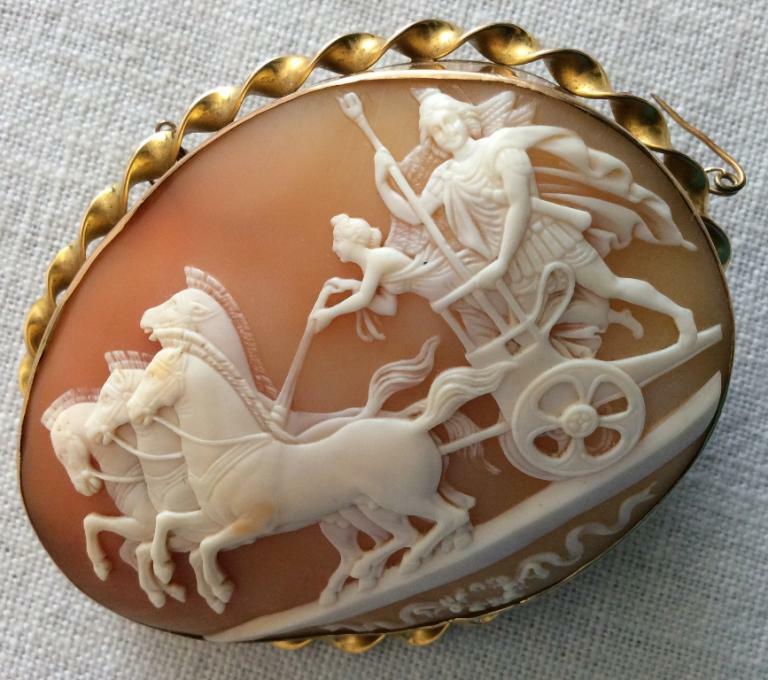 This is a Museum Quality cameo depicting a rare subject, Alexander the Great in his Triumphal Chariot companied by Nike, the Goddess of Victory, entering in Babylon. I have had just another cameo depicting this subject. The carver just reproduced all the details of the sculpture on this piece. 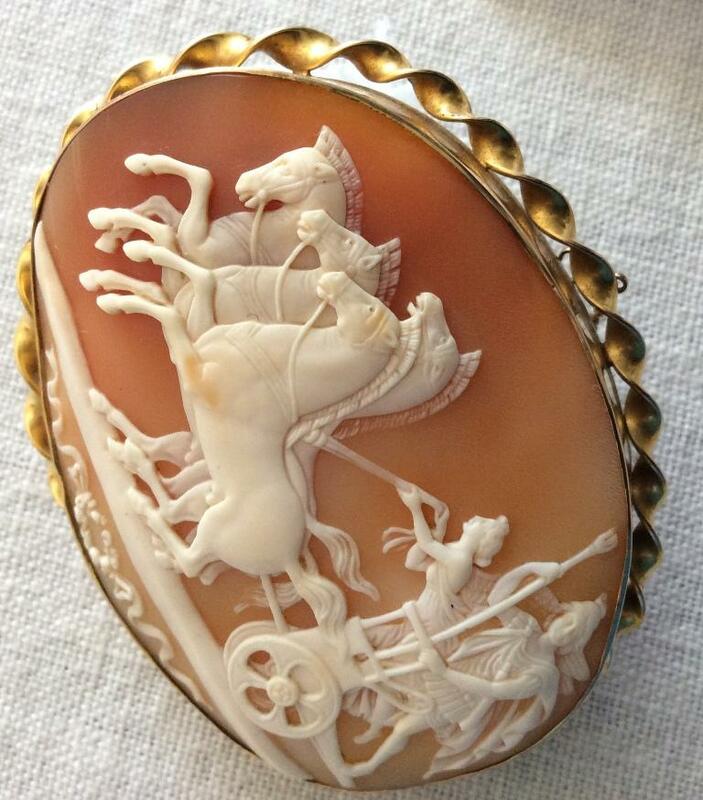 Simply fabulous, the carving is exceptional, look at how every detail is made, the chariot is just amazingly made, the galloping horses are just real, you can see each of their muscle dart under their skin. Nike is lovingly made while she is driving the chariot. 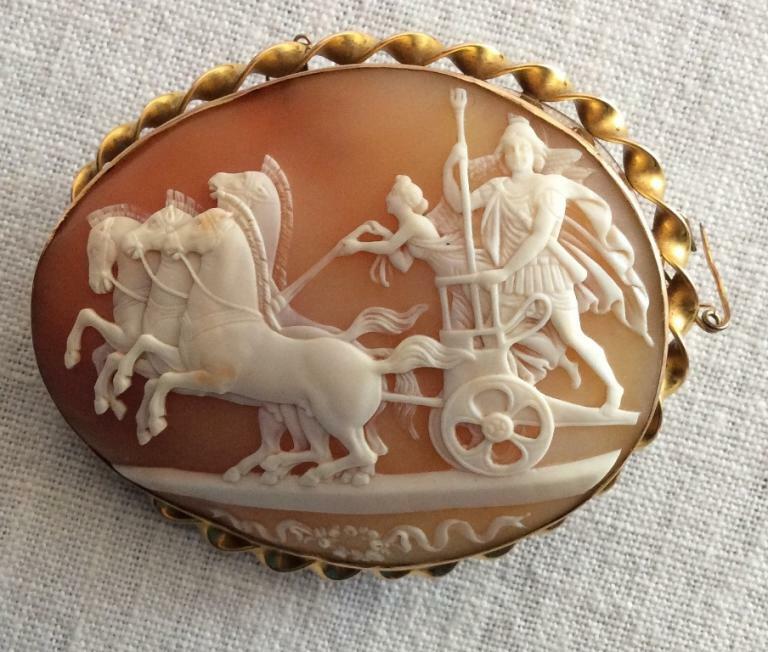 Alexander the Great stands, noble and fierce, on his chariot, close to Nike, his cloak softly moves in the wind. 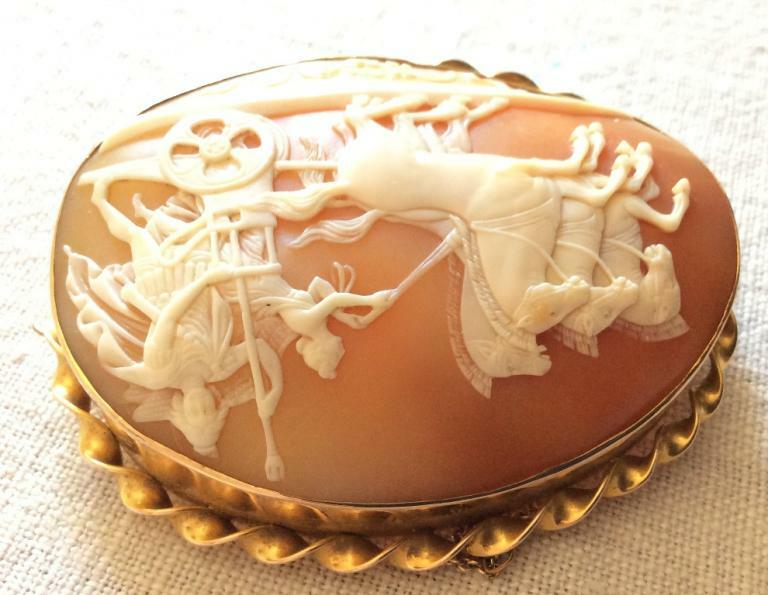 The carver further decorated this piece by adding a wreath embellished with flowing ribbons. 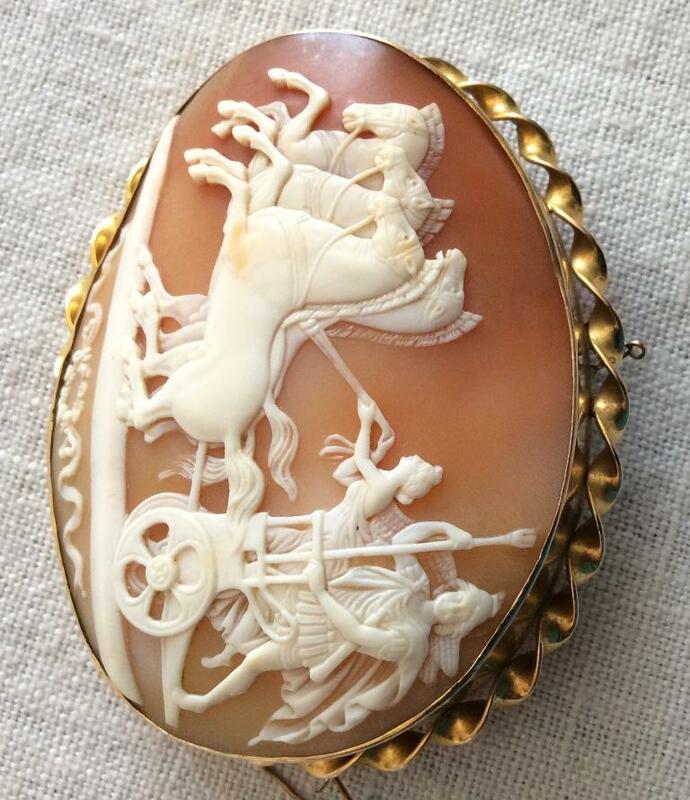 This cameo is really exceptional and rare. 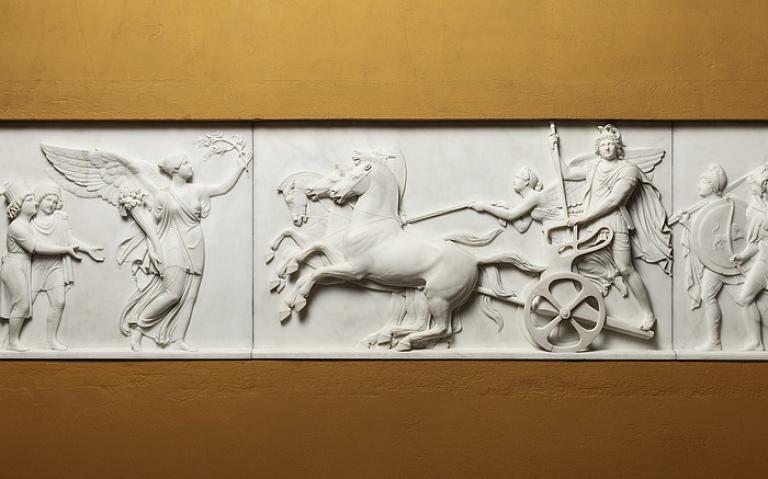 The subject is after Bertel Thorvaldsen Alexander the Great's Entry into Babylon, 1822 The central field, Alexander the Great in his Chariot is in marble in the inner courtyard of Palazzo Giraud-Torlonia, Rome. There is also a drawing made by Leonardo Camia (Died: before 1900) Alexander the Great in his Triumphal Chariot, Pencil on paper. This is a real collector find to not to be missed. 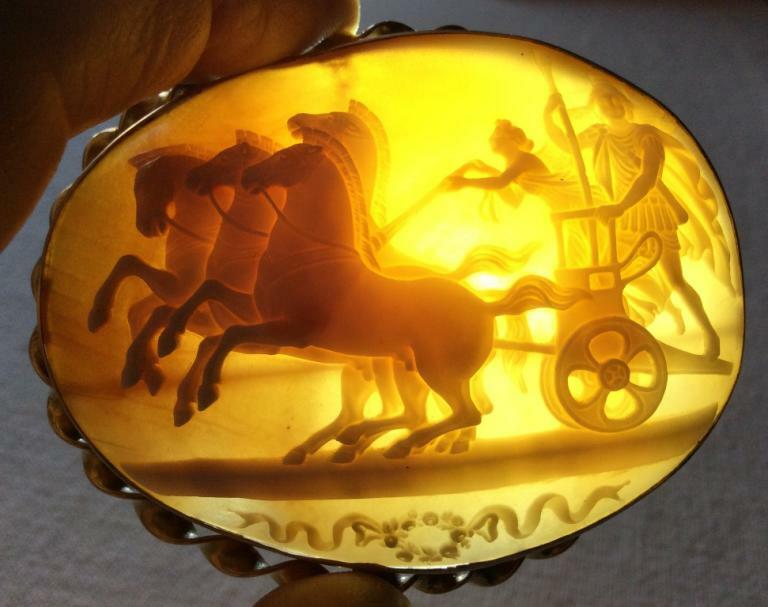 Alexander (356-323 B.C.) was born in Pella, Macedonia, the son of Philip of Macedon, who was an excellent general and organizer. His mother was Olympias, princess of Epirus. He was king of Macedonia and one of the greatest generals in history. He conquered much of what was then the civilized world. 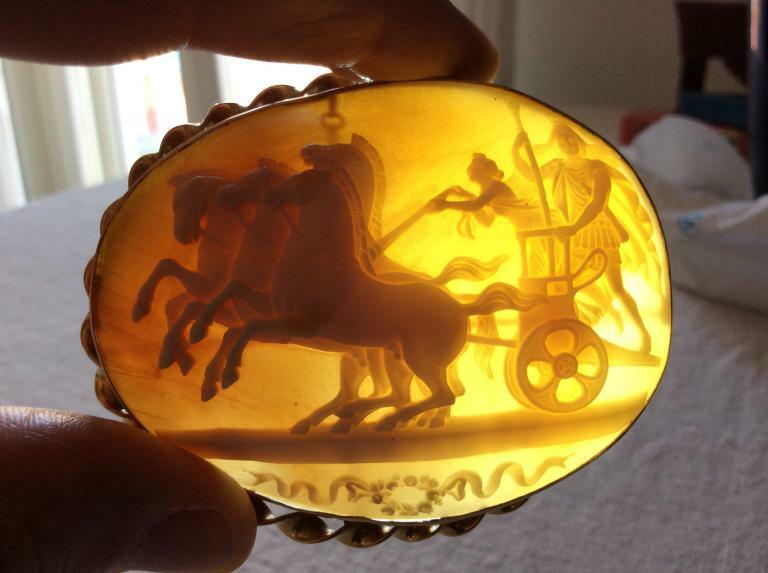 Alexander brought Greek ideas and the Greek way of doing things to all the countries he conquered. 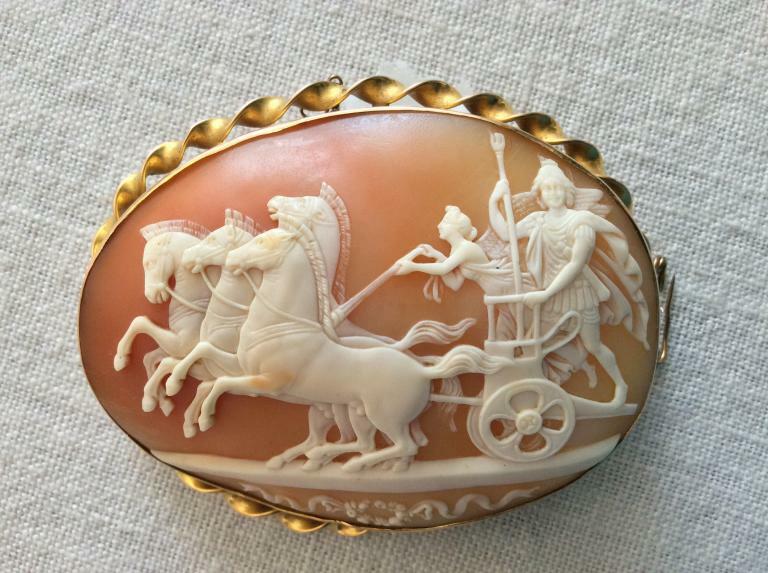 This great general and king made possible the broadly developed culture of the Hellenistic Age.